On July 27, the AGM participated in a tweetchat with Share the Love artist Janine Ramlochan about her work CYOA Rhythms. This interactive artist talk highlighted themes of migration, culture and ideas of citizenship in the information age, as well as the work’s site-specific location on the screens located at Mississauga Celebration Square. We invited Janine to elaborate further on the themes of her work outside of the 140 character limit. Read about CYOA Rhythms below! Q1: CYOA Rhythms uses video, text and images simultaneously. Could you talk about your process and source materials? The work was inspired by the ‘scratch video’ movement — video collage projections in 80s London-NYC nightclubs as artistic intervention. ‘Scratch’ was a term borrowed from the rap music scene at the time, to describe the video editing aesthetic. Clips of newscasts, commercials, popular TV shows, edited with sound, text and music, to create politically subversive meanings. As an experimental video artist, my process is like painting with video— applying layers, playing with texture and abstraction to create a rhythm. CYOA Rhythms combines several of my own independent works – video, painting and text, along with open source cartoons. Q2: What drew you to exhibiting CYOA Rhythms for the City of Mississauga and the Pan Am Games? I used to work in international media with diverse groups of colleagues and audiences, where inducing explosions of dialogue from varying perspectives, was par for the course. 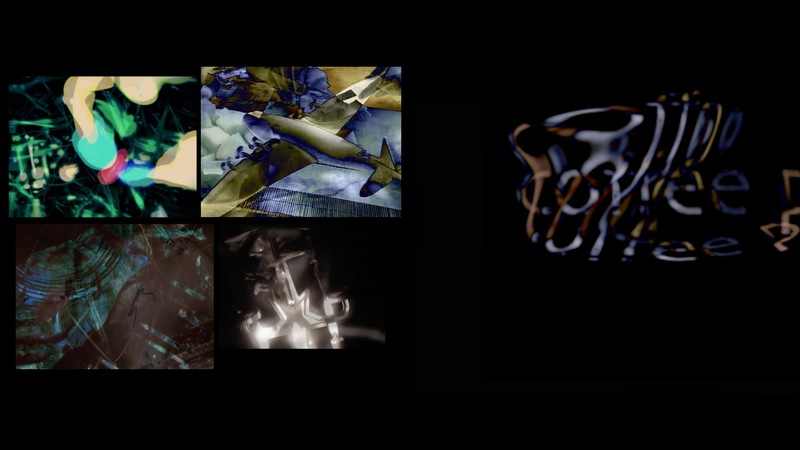 I try to look for opportunities to create similar experiences with my video installations. I felt, a Pan Am Games exhibit in a diverse city like Mississauga, would be a great venue to hold a dialogue for this work. Q3: Celebration Square is a high traffic hub next to Mississauga’s City Hall. What are your goals for screening there? The video installation was developed with cultural events in mind, to co-exist with other activities happening simultaneously. The rhythm was designed to punctuate different genres of music. The work seems to fit a Pan Am Games-related exhibit in a public square, where music would likely be part of the ambiance. I can only hope that the rhythm of the work mirrors the rhythm of activity happening at Celebration Square. Q4: What are some of the themes explored in the ‘CYOA Rhythms’ video installation? The installation explores cyclical repetition in migration, globalization, community friction and artistic intervention. For a Pan Am Games-related exhibit, ideas of national boundaries in a boundary-less world come to mind. Definitions of citizenship seem to ask for elasticity in our current informational age, especially seeing how strained the politics of migration have become globally. Q5: What could the idea of ‘citizenship’ mean in an informational age? Drawing on the research of Nick Stevenson, author of Cultural Citizenship: Cosmopolitan Questions, a paradox of globalization is how the flow of culture has met a ‘stasis’ in local perspective. We’re seeing this everywhere. If citizenship is seen as rights, duty, community ‘memberships’ or perceived norms, questions of culture emerge in how we perpetuate boundaries. Societies in and of themselves are self-creations— norms, values, language, that all give us a sense of unity. These can be stretched… redefined, if we choose. ‘Network’ as a metaphor comes to mind— circuits allowing simultaneous connection and disconnection. Instead of a national boundary, citizenship could be viewed as within a global network, where everyone becomes entitled to movement across interconnecting pathways. Currently, these citizenship pathways and modes of inclusion need re-envisioning. Perhaps, this is where artistic intervention could be valuable. Q6: What role does the media and technology play in cultural citizenship in the information age? Multiple identities raise questions. Media and technology, to varying degrees, play mediating roles — framing, constructing, perpetuating, providing platforms for discussion, giving voice, ignoring voice. While the use of surveillance technologies can illuminate dark spaces, for example, it can also play a role in monitoring and normalizing the behaviour of individuals. Questions of ‘who am I?’ have shifted to ‘how ought I to live?’ within our geo-political landscape, for many people. These all suggest an age where definitions of society and citizenship are becoming transformed. Thanks again to Janine for joining us and sharing her process in creating CYOA Rhythms.